Thanks for your purchasing this item. Please read and understand these instructions and keep this manual for future reference. This item uses solar power to recharge the batteries so it is always working after the battery gets recharged. 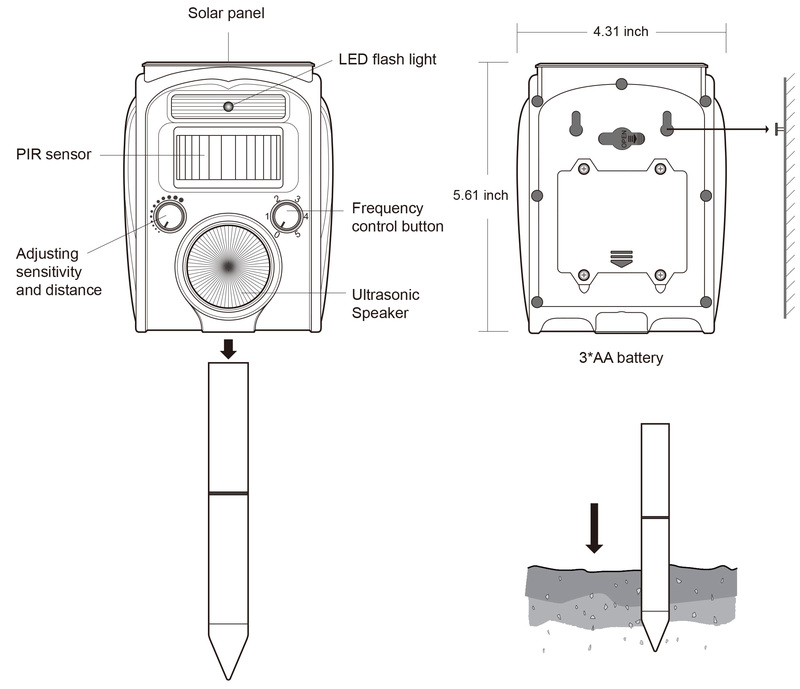 The Passive Infrared sensor (PIR) detects motion and triggers the ultrasonic speaker emitting a tone that animals can feel and thus chases away these animals. A strong ultrasonic wave to frighten animals. The wave is activated when an animal enters the PIR sensor range and when the animal perceives the ultrasonic wave they feel uncomfortable and will run away from the area. A strong flashing LED to scare animals. The strong flashing LED will be activated when an animal enters the area, then the animal will be scared by the light and will flee away. In order to have better effect we added an alarm sound to scare wild animals (newest feature). Button “Frequency” (Right): This is to control frequency. By turning the knob clockwise, the frequency will be increased. 4: Alarm and strong LED flashing lights to scare wild animals. 5: Function together mode 1, mode 2, mode 3 and turn on strong flashing. Remember to choose a place where the solar panel of the top can get sunshine for as long time as possible. If you mount the unit in the ground, insert the spike into the ground carefully. Please leave the spike 5 inches or more above the ground. It is suggested that you dig a hole and then insert the unit to ensure no damage occurs. The item can be inserted in the ground or mounted against the wall or put the top part directly on the flat surface. Power supply: solar power + 3x AA size rechargeable batteries or 9V 2A adapter. Adapter not included. If adapter plugged, the item will keep working, but the PIR sensor will not work. If there are a few days of clouds or rain, you can charge the item via the adapter. If new rechargeable batteries or batteries in the product are not in use for a long time (more than 1 month), the batteries power may be fully released. It is suggested to charge the batteries 3-5 times to re-activate them and they will become normal to use. If the batteries which have been used for a very long time can be charged fully very soon, it means you need to change the batteries. If the battery cannot be used for a long time, please replace 3 pieces 1.2V AA size rechargeable batteries (NiCd or Ni-MH) in the battery compartment. The better quality the batteries are, the bigger capacity the batteries have and the better effect the item will have. Please dispose of the used batteries in the recycling center for the used electrical and electronic devices. You can consult your local government directives on used batteries handling for more information. To clean the device, use damp-soft and mild soap with water. Do not use harsh chemicals or abrasive cleaning agents that may damage the device.